3. Gordon Bottomley (1874-1948). Verse drama and commentary, 1909-48. Gordon Bottomley like his friend Yeats was at the forefront of the movement to re-establish verse drama in Britain in the early years of the 20th century, and like Yeats turned to the nô for guidance. 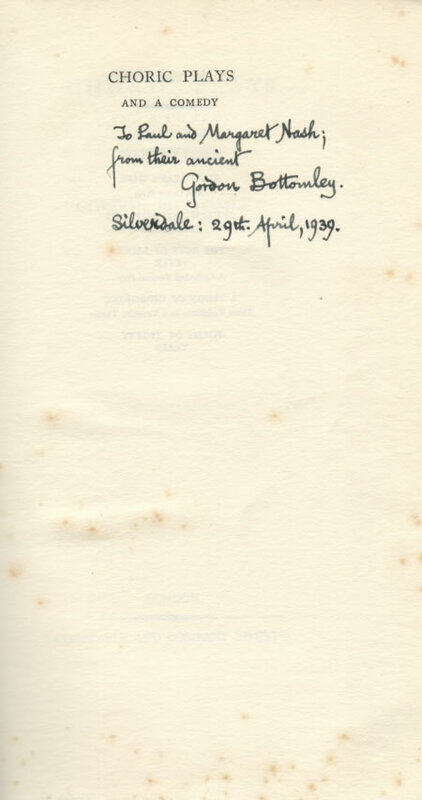 Images: signed editions of Bottomley’s plays, Scenes and Plays no. 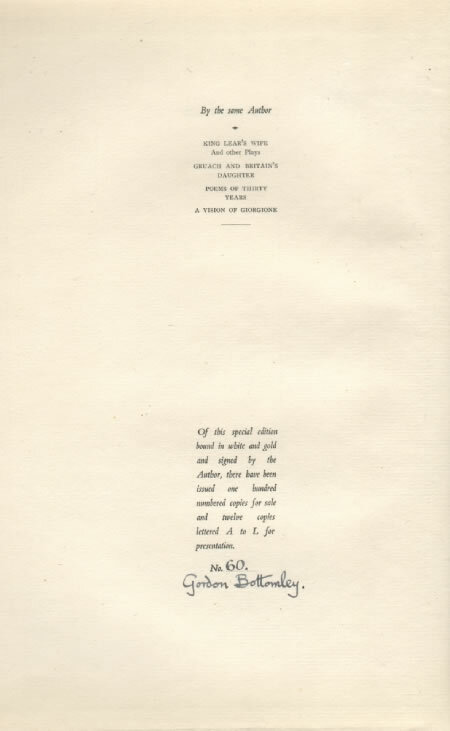 60 of 100 specially-bound and numbered copies signed by Bottomley; Lyric Plays inscribed by Bottomley to Mr. and Mrs. W. Macneile Dixon, the former (1866-1946) the author of The Human Situation (1937) and other works; Choric Plays inscribed by Bottomley to Paul and Margaret Nash, the former (1889-1946) a British artist known particularly for his paintings of the First World War ( ). 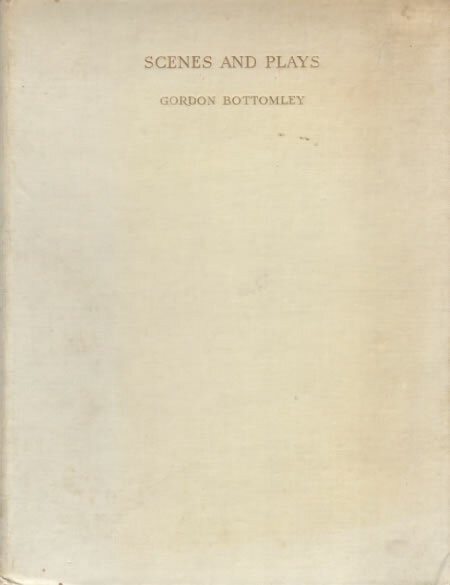 Bottomley’s plays in verse, numbering more than thirty, have become little more than a footnote in the literary history of the century, but for a time his powerful blank verse and fusion of costume, dance, music, lighting, and stage design placed him, along with Yeats, at the forefront of a movement to re-establish verse drama in Britain. 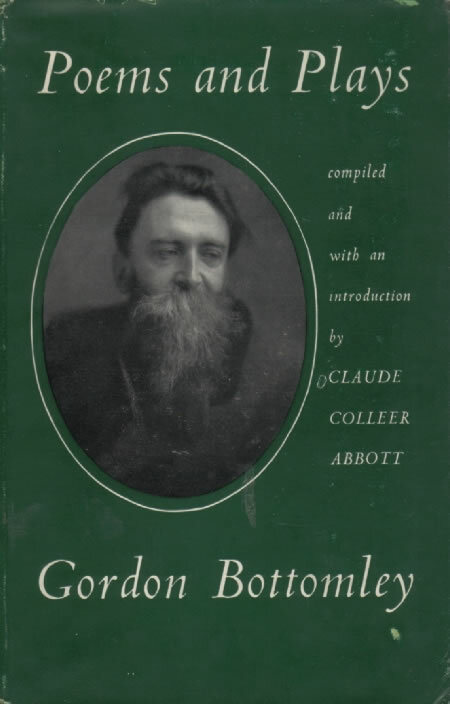 Bottomley’s plays were more successful and more playable than the verse drama of his friends Binyon (see especially BC22), Moore (see CA9), and Masefield (CA5), and like all the central figures in the movement—the poets themselves and Craig (D17), the theorist most closely associated with their work for the stage—Bottomley turned to the nô both for inspiration and justification. 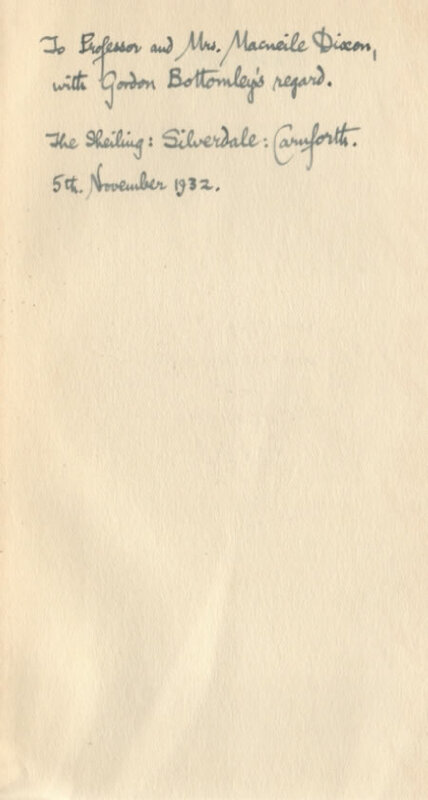 Contemporary documents do not link his verse drama to the nô in the years before Yeats’s experiments with the form, but in Bottomley’s own retrospective of his career, A Stage for Poetry: My Purposes with My Plays (Kendal: Wilson, 1948), he notes that he was ‘among the first experimenters with Yeats’s development of the Nô form’, and that by the time of Yeats’s experiments he had ‘been interested in the possibilities of the Japanese original for many years’. 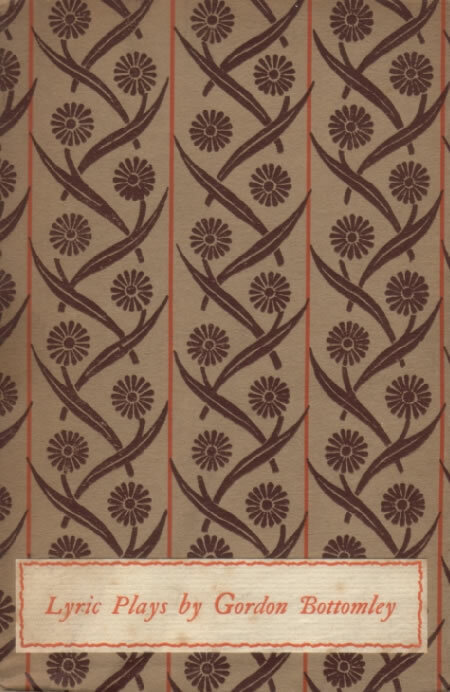 As early as 1909, seven years before the first performance of AT THE HAWK’S WELL (BL12), Bottomley’s Laodice and Danae (London: privately printed; reprint, Boston: Four Seas, 1916) was constructed around a central dance performed by masked players, and he recalls in A Stage that at a Cambridge performance of The Riding to Lithend (Flansham, Sussex: Pear Tree, 1909)—with its ritualised action, central dance, and nô-like chorus—his companion, a Japanese undergraduate at Trinity College, wondered aloud why Bottomley inquired so frequently about the nô, because ‘Much of it is like this’ (compare to Japanese reactions to Masefield’s THE FAITHFUL [CA5]). What is ‘like’ the nô in Bottomley’s drama is the stylised recreation of legend, the lyricism, dance, masks, chorus, minimalist stage design, and symbolic use of properties. These are most apparent in the works collected in Scenes and Plays (London: Constable, 1929), Lyric Plays (Constable, 1932), and Choric Plays and a Comedy (Constable, 1939). Bottomley’s connection to the nô and to Yeats’s adaptations of the nô is discussed by Nicoll (A21), Miner (A25 and BL129), Anniah Gowda (A32), and Franchi (BL218), but the best discussion of the subject remains Bottomley’s own, in A Stage, which throughout demonstrates the degree to which he turned to the ‘Japanese original’ for theory and technique. 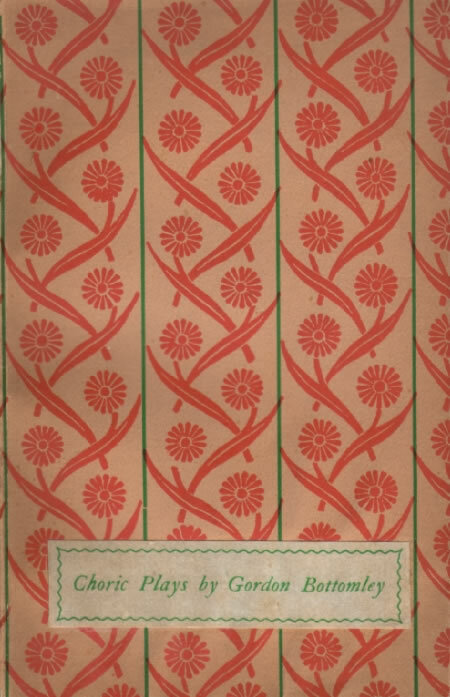 Poems and Plays (London: The Bodley Head, 1953) includes a generous selection of Bottomley’s drama and a poem TO YONE NOGUCHI. See also Bottomley’s ‘Note on Poetry and the Stage’ (London: Religious Drama Society, 1950), and BC29, 34b, 43, D15d, and 15e9.